Jackson-Triggs hosts inaugural East Meets West wine dinner to rave reviews! “Must be carrying some precious cargo we joke”, as we step up into the limo. Yes, there seated are a dozen or so wine critics, writers, sommeliers, and personalities! notables such as Tony Aspler, wine critic and author, the iconic, stunning Sara Waxman, Founder and Editor of DINE Magazine, Adam Waxman, handsome and devilish son of Sara, actor and contributing writer for DINE, wine author Konrad Ejbich and the dashing Paxton Allewell of the iYellow wine club, just to name a few. Del Rollo, National Director of Hospitality is excited to share the inaugural format this evening, which he describes to us as “East Meets West”, not only in wine but also, cuisine. Jackson-Triggs Okanagan winemakers Brooke Blair and Derek Kontkanen have flown in for the occasion to showcase their wines along with those of Niagara winemaker Marco Piccoli. We are also joined by Great Estates of the Okanagan Executive Chef Roger Planiden, who packed a variety of food “contraband” in his suitcase, as well as newly appointed Chef David Penny of Niagara. How will the foods and wines differ from east to west? With the Okanagan boasting the only desert in Canada, and with many more sun hours will they overpower the wines of our marginal climate here in Niagara-on-the-Lake? We disembark and are graciously handed a perfectly chilled glass of JT sparkling wine Methode Classique, from Niagara-on-the-Lake, Delightful, delicious and a perfect pairing to a variety of hors d’oeuvres being passed around as the crowd mingles. One of the greatest hits! is the truffle oil sprinkled popcorn we all savour with our bubbly; the contrast of the richness of the truffle and the crisp acidity of the sparking wine gets top marks from all. Two long tables are set for the fortyish of us in the sleek, modern and inviting Jackson Triggs building, in front of row upon row of vines. Behind is the lively kitchen where a trio of chefs is performing the magic. Let the competition begin! The first course is paired with a Riesling duo. 2007 Jackson-Triggs Okanagan Estate Proprietors’ Grand Reserve Riesling and 2006 Jackson-Triggs Niagara Estate Delaine Vineyard. Terroir speaks loudly here, as the Okanagan is more profound in fruit, but Niagara’s Riesling is reminiscent of petrol!a good thing, and a light dose of minerality! This “Tasting Gallery” continues with a second course pitting the 2008 Jackson-Triggs Okanagan Estate Proprietors’ Grand Reserve Sauvignon Blanc with the 2007 Jackson-Triggs Niagara Estate Proprietors’ Grand Reserve White Meritage. Individual palates prevail as our group takes ownership of their favorite. More Bordeaux in style, the Meritage seems to attract the larger number, particularly with a little time in the glass. The Barrel Cellar, is our next stop, as we descend a flight of stairs! mind the stilettos, to the aroma of romance and of tradition, and are seated amongst row upon row of oak barrels at several well-dressed tables. The following two courses are delicious, paired with two Chardonnays, a Shiraz from the Okanagan and a Delaine Vineyard Syrah. We love the Syrah, with plum, cassis and white pepper, supported by firm yet soft tannins. Both wines are winners though, having won multiple awards both at home and internationally. Mr. Jackson exudes passion, commitment, and a true sincerity. We like him. Our East Meets West Savour the Sights concludes at the Estate Lounge, back upstairs, two flights this time. We overlook the vineyards as we savour a variety of icewines paired with delectable desserts. A perfect long satisfying finish to an evening that started with a fine mousse dancing on our palates and concluded with a delectable sweet sensation, fine Riesling icewines and a Cabernet Franc. We’d like to add congratulations to Allan Jackson on the arrival of his first grandson this month, as well as congratulations on your Jackson-Triggs retirement and best wishes on your future adventures in wine. So long Mr. Jackson, until we toast again! https://www.thewineladies.com/wp-content/uploads/2017/08/WineLadiesLogoTransparent.png 0 0 Susanne Seelig-Mense https://www.thewineladies.com/wp-content/uploads/2017/08/WineLadiesLogoTransparent.png Susanne Seelig-Mense2009-07-29 12:00:012018-04-05 12:33:38Jackson-Triggs hosts inaugural East Meets West wine dinner to rave reviews! Never one to sit on our laurels, we are now armed with saber and flutes, on our current crusade to bring Champagne and Sparkling wines to the people! We hope you’ve been enjoying the multitude of wonderfully delicious and diverse alternative white wines we chatted about last issue. As you may recall we were champions for the ABC Club. Where we introduced our top ten alternative white wine choices outside the dominant domain of the almighty chardonnay. Hence the “Anything but Chardonnay” Club. With a plethora of brilliant bubblies now being produced from around the world, there’s a sparkling wine for you, just waiting to pop its cork. And yes, fabulous for festivities but also perfect for partnering with an array of foods due to its vibrant acidity. That acidity can act as a turbo charger for flavour in a recipe too, so say our award winning Chefs who have created sumptuous recipes just for us, using sparkling wine as a key ingredient. 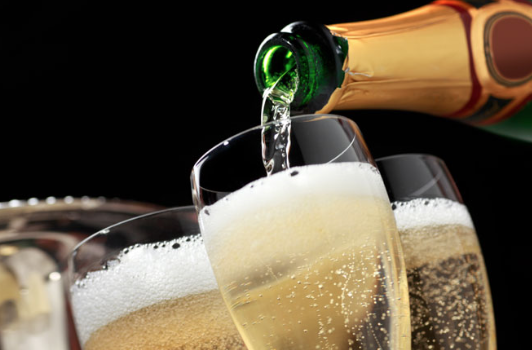 We’ll begin our journey by exploring a variety of ways of saying “bubbly” from Champagne to Cava, to Prosecco and Sekt. First stop, we’ll linger here a while, the most famous wine in the word, synonymous with glamour, celebration and decadence, Champagne. The name alone elicits images of excitement, of joy, of success, romance, and beautiful people! amazing the power of a 9-letter word! Speaking of which, a few perfunctory words on Champagne, if you will. Champagne is a place, a wine-growing region approximately 90 miles northeast of Paris. In order for a sparkling wine to be called champagne, it must come from this A.O.C. (appellation d’origine controlee) region and follow the rules of production as outlined by the meticulous Classic Method, or Methode Champenoise. What makes Champagne so special? It’s the combination of the soils, the terroir and the grapes that uniquely blend to provide the ultimate ingredient for the finest sparkling wine in the world. The producers, or Champenois as they say in Champagne, have the advantage too of experience and skill, with over three centuries, practice makes perfect! Champagne comes to us in many styles, from the Blanc de Blanc, made exclusively with Chardonnay, the Blanc de Noirs, you got it, red grapes only, and rose champagnes too. Pink or rose Champagnes are made by either adding a small proportion of red wine to the blend or less commonly, allowing the juice to remain in contact with the dark skinned grapes for a short time during fermentation. Vintage Champagnes, typically 3 or 4 only in a decade, and Prestige Cuvees representing a champagne house’s best, are also out there; the possibilities are endless. When it comes to a toast, Champagne obviously rules as the beverage of choice, but what about as an aperitif, or as a partner to accompany you throughout your meal from appetizers to dessert? And at snack time, there’s nothing better than Champagne with potato chips! Perhaps an NV Brut would be nice? With all the different styles of champagne, there’s a bottle of bubbly to suit every occasion, every dish and everyone’s palate! For a few Champagne and food pairing tips, read on! Champagne and oysters: well known to be a match made in heaven. Opt for a delicate young Brut Champagne. The acidity acts like a squeeze of lemon, while the crisp bubbles counter the fatty slippery texture of the oyster. Blanc de Blanc Champagnes are elegant and tangy, they go well with lighter style foods beautiful, with goat cheese and sushi. Blanc de Noirs Champagnes have the complexity of red wines and are well suited to lighter meat dishes such as veal, partridge or pigeon. Brut Champagnes, crisp and dry with good acidity cut through the fat of fried foods!did we mention potato chips? Oh yes, we did, obviously a weakness of ours. Serve the sweeter Champagnes with fresh fruit, berries and other desserts that are not too sweet. The question beckons, is there any time a Champagne just won’t do? Here’s what Madame Lilly Bollinger of Bollinger Champagne, and James Bond movie fame, said when asked her opinion “I drink it when I am sad. Sometimes I drink it when I am alone. When I have company, I consider it obligatory. I trifle with it when I’m not hungry and drink it when I am. Otherwise, I never touch it unless I’m thirsty”. Well said, Madame, The Wine Ladies couldn’t agree more! Moving on, although Champagne is dear to our hearts, other sparkling options await us, wonderfully delightful and unique with new flavours and styles to embrace. Spain is our next stop with its incredibly valued sparkling wine, they call Cava. Easy on the pocketbook, and easy to enjoy any time any where, these bubblies will please your palate by their lonesome, in a cocktail or with a variety of dishes. Finding great Cava under $20.00 is not unusual. 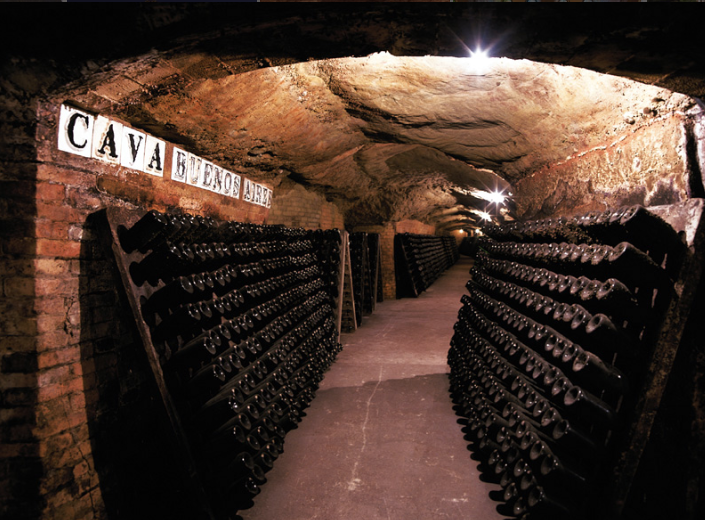 Cavas are made in the classic method, and just as in Champagne are restricted to certain grape varieties. They too must come from a list of designated municipalities including Catalonia. This is where close to 95% of all cava is produced. One of the reasons Cava is so affordable is the widespread use of highly efficient modern methods of production. Keeping the costs way down. This coupled with high-yielding grapes provides a winning price/quality ratio for Cava. The proof clearly being in the bottle. A Reserva Cava with a pronounced yeasty, toasty character or a Cava Rosado, a rose with attractive red fruit such as cherries and blackberries are wonderful introductions to the world of Spanish sparkling. Prosecco, a spirited sparkling wine, and a white grape variety native to the Veneto region in north east Italy. The home to Verona, the setting of Shakespeare’s Romeo and Julliet. For the jet set, also the base for the famous Bellini cocktail. 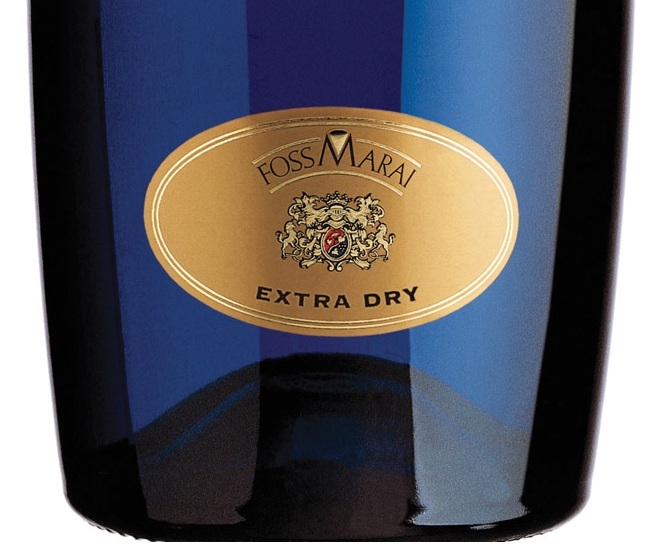 This fashionable sparkling wine from Veneto is steadily gaining in popularity. Showing off its allure of freshness and simplicity, clean and lean. No yeasty, buiscuity quality here, as with Champagne. Expect mineral notes, lemony, apples and pear, soft and inviting. The bubbles are a little less tight, having been fermented in a tank. Most often, as opposed to the bottle, but that’s ok, for this uncomplicated well priced sparkling, Prosecco delivers well. Partnering Prosecco with a variety of appetizers is no difficult task either, with their fruit and crisp acids, plus the lively bubbles handling salty or fatty dishes is no problemo! Finally we come to Sekt, the term used in German speaking countries to describe sparkling wines. We salute the wine lovers of Germany. They appreciate the joy and diversity of sparkling wines being among the highest consumers/capita in the world. There are several quality levels of Sekt available for our enjoyment. 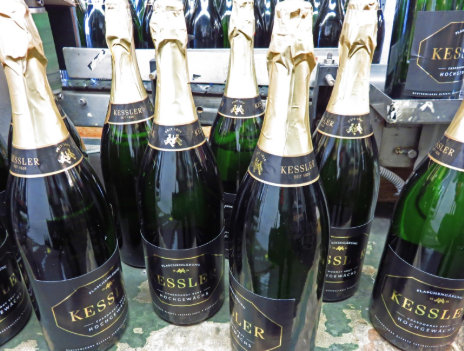 We would encourage you to seek out those sparklers labeled either Deutscher Sekt or Sekt bA. Simple Sekt, is a sparkling wine that is made with grapes from other countries, while Deutscher Sekt of course uses German grapes. Taking it one step further, if you can source a Sekt b.A. (b.A. means from a specific region) these sparkling wines are the pick of the crop! Sort of to speak. Finally, “the piece de resistance”, we said there were several levels, when it comes to Sekt is finding a b.A. This includes a vineyard site, the name of the grape varietal, and/or a vintage. These are the superior sparklers, having undergone strict quality control. Our absolute favorite has got to be, unequivocally, those Sekt which are made with the noble grape variety, the aromatic and racy, Riesling. With its pronounced acidity, these wines are ready and able to do table duty at any time and any place. I hope we’ve made a compelling case for the bubbly, the one that sparkles, that enchants, that knows, no boundaries. From a toast, Cheers, Salute or Prost, to an appetizer, through to dessert, you can take this special fizz anywhere, anytime!. and you can take that straight to the bank! Speaking of banks, there’s no need to break that either, thanks to the multitude of superb value sparkling wines just waiting to be popped! Explore, experience and enjoy! 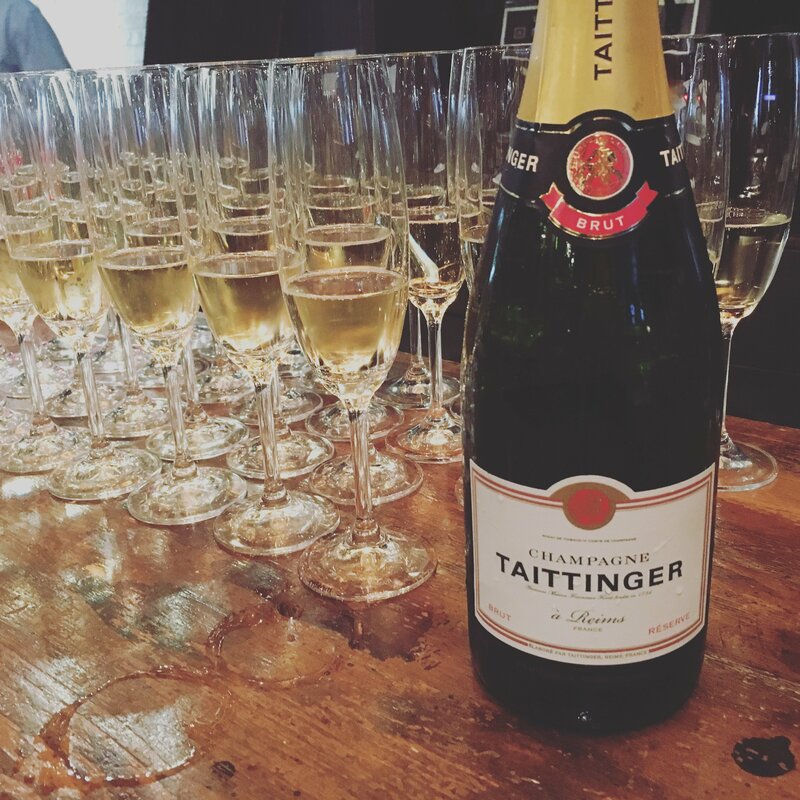 Did we mention, that a silent hush, rather than a thunderous popping cork is the preferred way of opening Champagne? Cheers everyone, and please do email us with any sparkling wine favorites, recipes or stories, we’ love to hear from you! We’re twittering too, we’re on facebook and we’re scouting for fans! Have a superb summer, we’ll be back in the fall. The Wine Ladies talk Champagne, bubbly, art and passion! 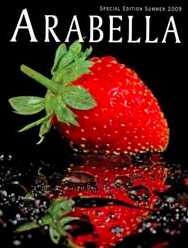 Arabella Magazine The Wine Ladies radio. https://www.thewineladies.com/wp-content/uploads/2009/07/Screen-Shot-2018-05-06-at-10.36.00-AM.png 350 532 Susanne Seelig-Mense https://www.thewineladies.com/wp-content/uploads/2017/08/WineLadiesLogoTransparent.png Susanne Seelig-Mense2009-07-29 12:00:012018-05-06 10:55:50You can take this special sparkling fizz anywhere, anytime! Cheers, Salute or Prost! Bubbles & Bites as read in Arabella Magazine. Set that dial to CP24 Radio1050 (1050 am radio dial) or on line at http://www.CP24 .com every Saturday morning at 10a.m. to connect with The Wine Ladies radio show. Our grandmother often enjoys a glass of sherry or port after dinner. Her 75th birthday is coming up and we’d like to surprise her with something a little different. Someone suggested we buy her a bottle of Madeira, which we have done but really know nothing about. Could you give us an idea of what Madeira is so we can sound a little more informed when she opens her gift? Thanks and much appreciated. INAUGURAL MIKE WEIR CHARITY CLASSIC Raises over $350,000 and counting! NBA legend Michael Jordan, Oscar winner Kevin Costner and NHL all-star rookie Luke Schenn as well as PGA TOUR stars Stephen Ames, were all present and accounted for at the inaugural Mike Weir Charity Classic held Monday July 20th, 2009 at Glen Abbey. https://www.thewineladies.com/wp-content/uploads/2017/08/WineLadiesLogoTransparent.png 0 0 Susanne Seelig-Mense https://www.thewineladies.com/wp-content/uploads/2017/08/WineLadiesLogoTransparent.png Susanne Seelig-Mense2009-07-24 12:00:012009-07-24 12:00:01INAUGURAL MIKE WEIR CHARITY CLASSIC Raises over $350,000 and counting! a decadent tented afternoon event sure to be the toast of the town. A fabulous fundraiser sponsored by Capital Paving Inc. www.capitalpaving.net to help support The Optimist Club in raising money to build the new multi-use recreational facility in the picturesque town of Puslinch. An elegant country afternoon on one of the last lazy warm days of summer. Enjoy locally grown food prepared by top local culinary talent, dishes prepared by Guelph’s premiere events and catering company Appetizingly Yours Events & Catering, http://www.appyours.com local restaurateurs including among others, the renowned Aberfoyle Mill Inn www.aberfoylemill.com and Envers of Morriston http://www.enversofmorriston.ca/. Refreshments will flow as some of the top local wine and beer producers will be pouring their very best including local craft brewer Sleemans http://www.sleeman.com/en/index.html ) and Niagara’s own, Joseph’s Estate Winery http://www.josephsestatewines.com/index.html. All for you to sip and savour as you are entertained by a variety of talented local musicians. Delicious wines and beer, excellent food and wonderful entertainment all for a worthy cause and all local, within 100km from the soil to the table, keeping the carbon foot print to a minimum, helping the environment and the local economy. Once built, the Puslinch Multi-Use Recreational Facility will be a wonderful gathering place for the community and will be a public facility hosting many activities and events including; corporate and community gatherings, a weekly farmer’s market, sporting tournaments, recreational skating, basketball, weddings and fall fairs. The Optimist Club of Puslinch http://puslinchoptimists.bizland.com/ will be building this wonderful facility and all proceeds raised from the afternoon will be for the building of this new community centre. We invite you to join us all for a good cause. See you there. To find out the scoop set that radio dial to CP24 Radio 1050 or on line at www.CP24.com Saturday morning August 15th at 10a.m. to connect with The Wine Ladies radio show. A Decadent Tented Event entitled Farm to Fork is our focus this Saturday, chatting up the finest in local cuisine, wine and craft beer, all for a great cause. Capital Paving Inc. President Geoff Stephens joins us, with Junior Field Engineer Matt Downey, and President of the Optimist Club of Puslinch, Ken Williams. Discover Sleeman’s craft brewery with guest John Sleeman and much more! Set that dial to CP24 Radio1050 (1050 am radio dial) or on line at www.CP24.com every Saturday morning at 10a.m. to connect with The Wine Ladies radio show. Georgia is absolutely in heaven! Her two most favorite things in the world all in one week! wine and golf, golf and more golf!